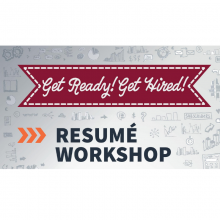 Resume Workshop- Richmond: Create an effective resume or improve the one you already have. A well-written resume signals to employers that you are qualified, skilled, and professional. Learn what to include on your resume (and what not to) as well as how to tailor your resume for specific job applications, so you get results! Includes lots of examples focused on maximizing your experience as a student to highlight what you can do!